UMD Provost Mary Ann Rankin welcomes event attendees. State and University of Maryland, College Park (UMD) leaders gathered in Annapolis, Maryland today for the launch of a research and education institute that unites engineering, planning, social sciences, computer sciences, business, public policy, and public health experts. 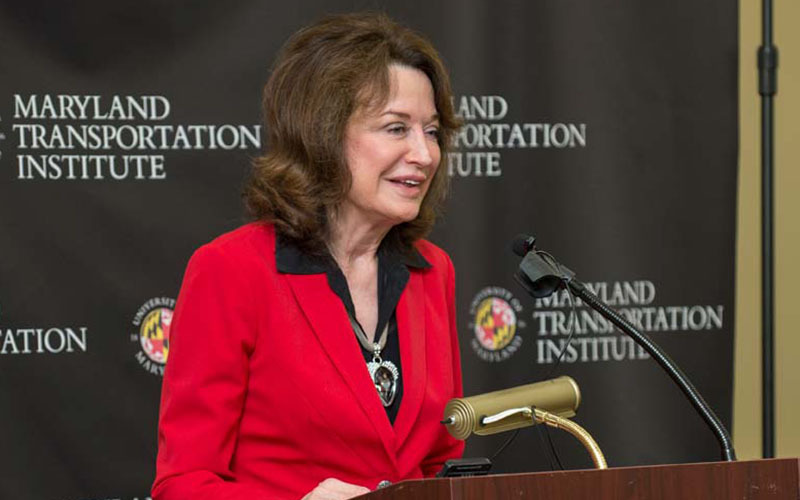 The Maryland Transportation Institute (MTI) will coordinate more than $20 million in annual research expenditures to spur innovation in the transportation sector. “Through its important research, this institute will help us remain one of the most innovative transportation departments in the country,” said Maryland Department of Transportation Secretary Pete K. Rahn, who spoke at the event. Led by the A. James Clark School of Engineering’s Herbert Rabin Distinguished Professor Lei Zhang, MTI was approved by UMD’s Office of the Provost last fall. The institute will focus on transportation big data, connected and automated transportation, congestion mitigation, freight and logistics, infrastructure planning and policy, transportation safety and security, smart cities and communities, and future mobility systems. The institute leverages the largest transportation data and data analytics center in the nation and a U.S. Department of Transportation-designated National University Transportation Center. 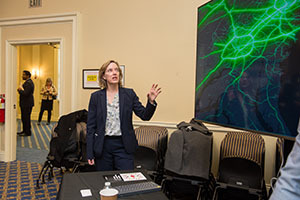 MTI also encompasses leading centers in smart growth, cybersecurity, GIS, logistics, sustainability, computer sciences, behavioral sciences, and public health. The April 3 event featured a number of transportation technology solutions, including a mobile app that helps combat congestion by providing personalized travel incentives. The Center for Advanced Transportation Technology introduced attendees to a suite of decision-making tools backed by big data analytics, while undergraduate students from UMD Loop presented their design for the SpaceX Hyperloop Competition. 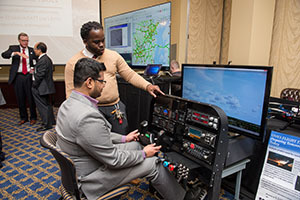 Collaborators from Morgan State University’s Urban Mobility & Equity Center and the Department of Engineering and Aviation Sciences at the University of Maryland Eastern Shore also shared a cutting-edge driving simulator that helps reduce traffic accidents and a workforce development program for the aviation industry, respectively. Additional speakers included Maryland Department of Commerce Deputy Secretary Ben Wu; Laurie E. Locascio, UMD vice president for research; and Clark School of Engineering Dean and Farvardin Professor of Aerospace Engineering Darryll Pines. The event was attended by a number of Maryland elected and agency officials, as well as industry and university partners. MTI was formed through support from 10 UMD colleges and schools: School of Architecture, Planning, and Preservation; School of Arts and Humanities; College of Behavioral and Social Sciences; Robert H. Smith School of Business; College of Computer, Mathematical and Natural Sciences; A. James Clark School of Engineering; Philip Merrill College of Journalism; College of Information Studies; School of Public Health; and School of Public Policy.